INFLUENCE OF DIABETES ON NATRIURETIC PEPTIDE THRESHOLDS IN SCREENING FOR STAGE B HEART FAILURE Watson C, James S, O’Connell E, Gallagher J, O’Reilly J, Tallon E, Baugh J, O’Connell J, O’Shea D, Ledwidge M, McDonald K.
LATE CARDIAC EFFECTS OF CHEMOTHERAPY IN BREAST CANCER SURVIVORS TREATED WITH ADJUVANT DOXORUBICIN: 10-YEAR FOLLOW-UP Murtagh G, Lyons T, O’Connell E, Ballot J, Geraghty L, Fennelly D, Gullo G, Ledwidge M, Crown J, Gallagher J, Watson C, McDonald KM, Walshe JM. Mahon N, Nuñez J, Briguori C, Passino C, Murray PT. A COMPARISON OF HFREF VS HFPEF’S CLINICAL WORKLOAD AND COST IN THE FIRST YEAR FOLLOWING HOSPITALIZATION AND ENROLLMENT IN A DISEASE MANAGEMENT PROGRAM Murphy TM, Waterhouse DF, James S, Casey C, Fitzgerald E, O’Connell E, Watson C, Gallagher J, Ledwidge M, McDonald K.
EVOLVING USE OF NATRIURETIC PEPTIDES AS PART OF STRATEGIES FOR HEART FAILURE PREVENTION McDonald, K. and M. Wilkinson. THE PRACTICE GAP IN HEART FAILURE — THE ELEPHANT IN THE ROOM Kenneth McDonald1* and Joe Gallagher2. 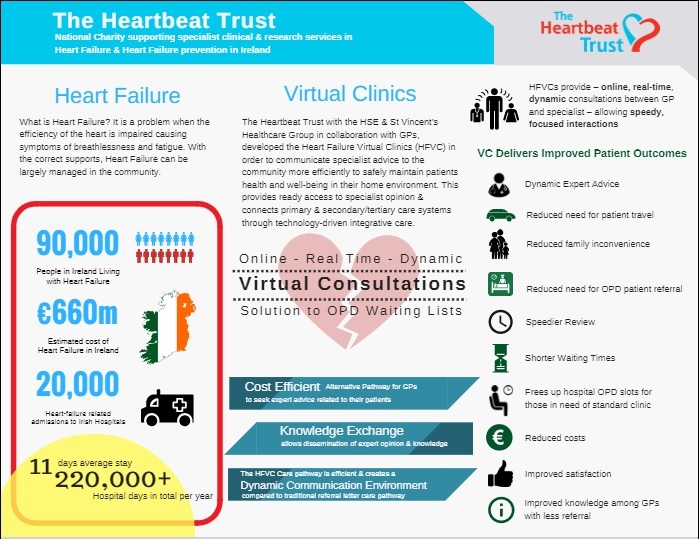 THE PRACTICE GAP IN HEART FAILURE — THE ELEPHANT IN THE ROOM Joseph Gallagher, Stephanie James, Ciara Keane, Annie Fitzgerald, Bronagh Travers, Etain Quigley, Christina Hecht, Shuaiwei Zhou, Chris Watson, Mark Ledwidge, Kenneth McDonald. Here are some our educational PDF’s. Click on the image to view.